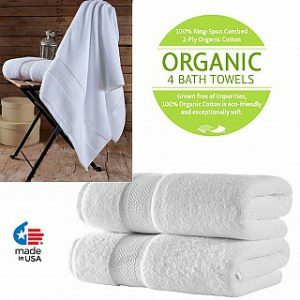 Set of 4 Luxury Oversized ORGANIC COTTON Bath Towels Only $6.99 Per Towel, cheap for organic cotton towels! Shipping is Free. The Organic Cotton bath collection is proudly manufactured in the last operating terry producing mill in the United States. Towel dimensions are 30″ X 54″.